I have known for the past two weeks that the subject of my blog would be coldframes—I don’t always know what I’ll write about that far ahead. However, I thought the title would be Coldframe Transplants. 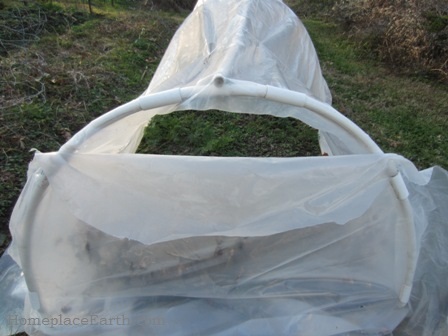 Before I began writing the new post I reviewed my previous posts about coldframes and realized that I had written much of what I would say this time in Use Your Coldframe All Year last May. So, I encourage you to read that post. 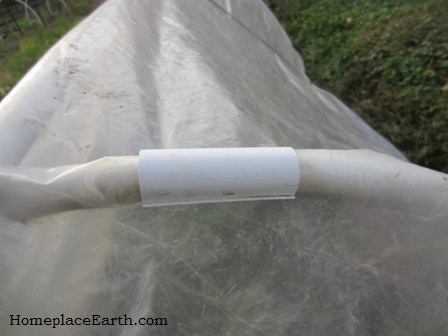 I had taken some good photos of my coldframe in April and realized that I could focus this post on coldframe lids. The coldframe in the photo is 4’x 8’ and has four 2’x4’ lids made from twinwall polycarbonate panels. They were made from one 4’x 8’ twinwall panel that friends gave me when they were replacing the glazing on their solarium. I have considered putting wood frames around the twin wall panels to protect the edges, but haven’t gotten around to it. 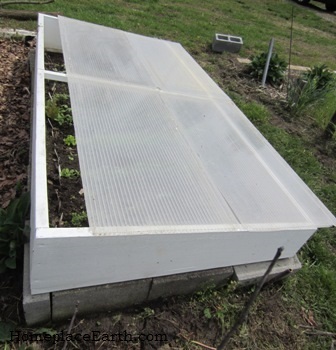 With a coldframe this big, using one panel for a lid would be awkward to use and to store. My previous coldframe was 3’x 6’ because I was given a piece of glass that size that I framed in wood. One advantage of that lid was that it was heavy enough not to blow off in the wind when I had it lifted on one side for venting. A disadvantage of that lid was the weight and size when I stored it in the barn for the summer. I have never liked using hinges on coldframe lids because hinges would limit their use. I want to be able to move the lids around or take them off completely. When I taught at the community college one of the projects I assigned was to plan a season extension structure for a 4’x 25’ bed—complete with a drawing of the design, list of materials, and how it would be used. If the students chose to use a series of coldframes I always warned them I would take off points if there were hinges on the coldframe lids. Sometimes you need to take them all the way off. 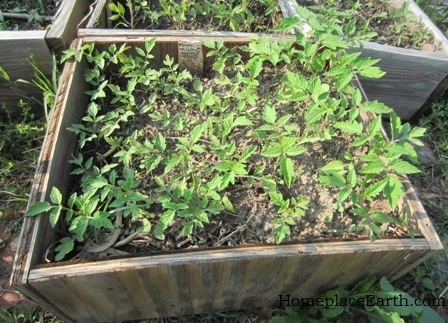 If you tilt them back, as in this photo, there needs to be room for them behind the coldframe. These panels are relatively light. If I had them lifted on one side to vent, the wind may blow them off. It can get pretty windy in the spring. I was gone for five days the second week of April. Things were just coming up in there, so I wanted to keep the lids on while I was gone. However, looking ahead to the weather, it looked like some days would be quite warm. I decided to turn the panels parallel to the long sides of the coldframe and lower them a bit, leaving a vent space at the top. That would keep everything warm enough, but not too hot. It was nice that the day before we left for the trip we had an inch of rain—with the panels off. Sometimes I stack the panels on the coldframe if I want to vent it a little more than I did when I went on the trip recently, but still keep some protection there. If I was going to vent that way more than a day or two, I would not stack the panels, but take two away so as not to prevent light transmission. The extra panels can lean against the side or back of the coldframe, ready to put back on when needed. When I store the panels for the summer they only take the footprint of one panel. 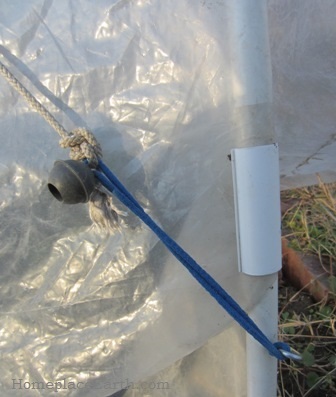 Your coldframe lids might be old windows or wooden frames covered with plastic. Consider all the different ways you might use them before building your coldframe, so as not to limit your possibilities. 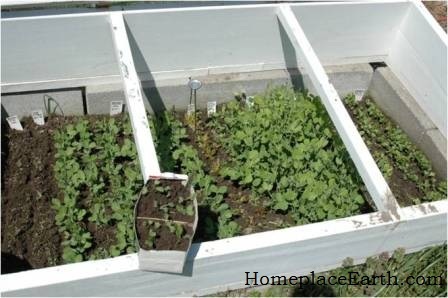 By this time of the year, you may be frost free and can store your lids for the summer, but your coldframe will still be of service as a space to grow transplants all through the growing season. A recent snowfall gave me an opportunity to take some new photos. Things can come and go right before our eyes, and if we don’t take the time to look carefully we’ll never see them. I like to take photos of the snow melting to remind me of the variations in soil temperature and the micro-climates we have everywhere. I mentioned soil temperature in my post on Phenology. This garden photo was taken on February 18. 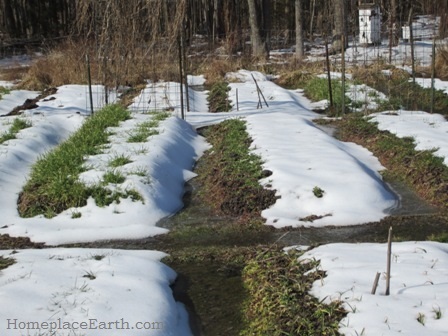 The weather was warming and the first place the snow began to melt was on the south side of my garden beds, which run from east to west. When I see this in late winter I’m reminded of the idea I’ve always had in the back of my head to make the soil on a garden bed slant towards the south. 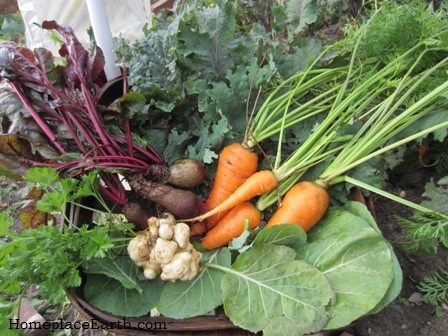 This could be done in the fall and the bed would be ready early in the spring, or even late winter, for planting. The soil would warm first on the whole bed. 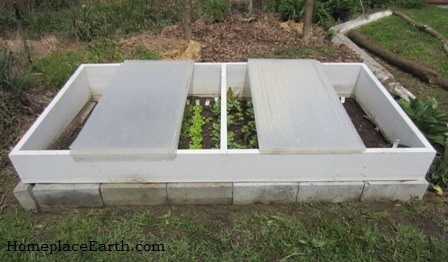 With a cold frame on top, things could get off to a really good start. So far, however, my coldframes have stayed on flat ground. The covers slant, since the front (south) side is 8” tall and the back (north) side is 12” tall. On February 20 I took this photo of the coldframe which had no cover for the winter because it wasn’t planted. The snow had melted everywhere except the places with the most shade. Since the sun is so low in the sky during these winter months, it casts a longer shadow. 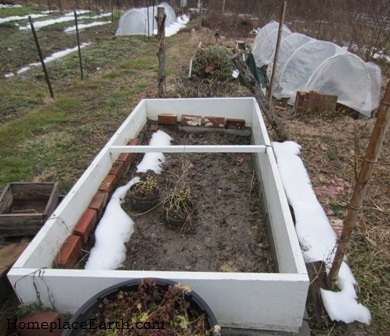 If I would have had a cover on that coldframe, the snow would surely have melted everywhere in there. However, the front of the box would still be shading the strip of soil beside it. The sides of the box cast a shadow, also, but only for part of the day. The east side (foreground) is shaded in the morning and the west side is shaded in the afternoon. The strip to the south (with snow) stays shaded all day until spring when the sun is sufficiently high enough in the sky to peek over the edge all day. You could solve that problem by using a clear plastic row cover. 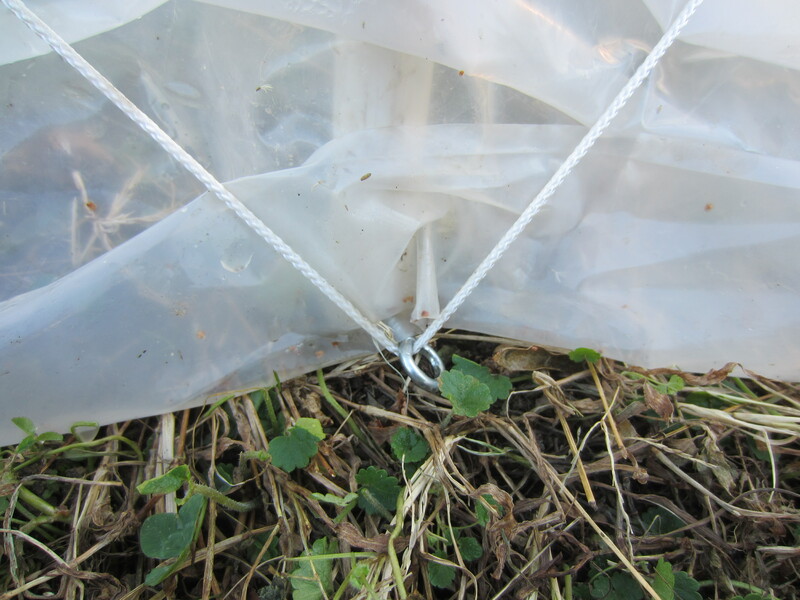 With clear plastic coming all the way to the ground you don’t have that shaded area on the inside; however, the structure itself will shade just to the north. 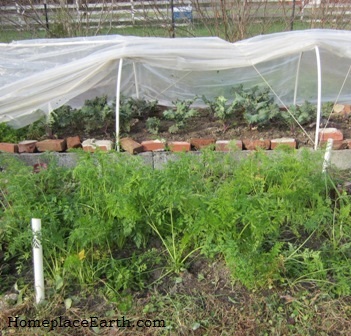 You can see that by the row cover in the topmost part of the coldframe photo. The area to the north of the coldframe is also left with a bit of snow where it is shaded. I don’t have plans to plant anything directly to the north of these two structures, but it is interesting to note. 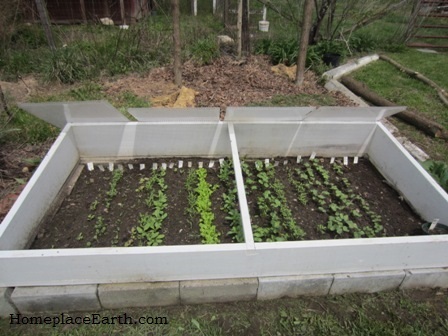 When I plant seeds in the coldframe I plant many rows. I run these rows across the short way, north-to-south. If that bit of shade on the inside is enough to affect anything, it won’t affect all of one thing. Other interesting snow / shade spots are to the north of our board fence. You would think that since there is space between the boards, the sun would reach through. 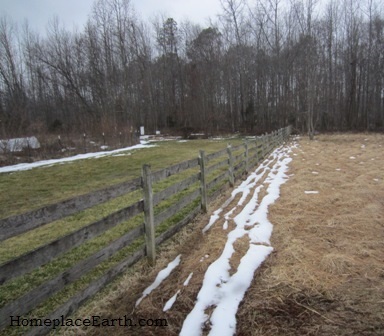 There is also a line of snow to the north of the hazelnut hedge in the upper left of that fence photo. There is a wire fence there and the hazelnut trees have lost their leaves, but it is still enough to leave a snow line. You don’t have to have snow to notice the shaded areas, but it is a whole lot easier. When I took the first photos on February 18 the snow had melted in the front yard, but not in the back yard (north side of the house). On February 20 when I was out with the camera I noticed that half the snow had melted in the backyard. There was still snow in the area that showed up as a shadow on the snow in my photos two days earlier. Last summer I paid particular attention to the sun and shade there in the flower bed near the house (very last place for the snow to melt). I was looking for a space to plant a few cotton plants that I wanted to keep separate from my other cotton. I determined that the sun was high enough, and would be that way long enough, for the cotton. It was with careful consideration that I put those cotton plants there. That would have worked, too, except that the summer was extremely cloudy and even the cotton that was planted in the sunniest part of the garden didn’t mature. Oh well. I’m sure you’ve noticed the days getting longer and spring will be here before you know it. The sun will cross the sky a little higher each day, making the shadows not quite so long. 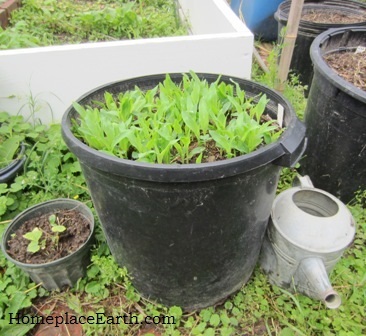 If you pay attention to the little nuances occurring in your garden you will be off to a good beginning as you start your seeds and set out transplants.